Ramen is a Japanese noodle dish made out of wheat noodles served in a meat or seafood based soup, often flavoured with soy sauce or miso then topped with different ingredients ranging from sliced meats, dried seaweed, kamaboko, green onions, pickled bamboo, wood ear fungus and occasionally corn. Today the true ramen can be only found in Japanese restaurants and rarely at home due to the popularity of 2 minute ramen noodles so if you haven’t tried the real one I suggest you do as it is really good and very comforting. A very popular noodle dish in Japan since the 1900’s where it is served by restaurants serving Chinese cuisine. Food hawkers which sell ramen and gyoza also became popular, they primarily cater for workers during those times. Then in 1958 the instant ramen / noodles was invented by Momofuku Ando and since then the fresh version slowly become less popular and sometimes forgotten, even in restaurants the instant variants are used, it became really popular you can buy it everywhere. Like everyone else I also forgotten that I can make non instant ones at home but today it will be different as we will be making a real ramen dish. Shio Ramen – Salt Ramen, this is basically the oldest type of ramen dish. Its broth is made with lots of salt, chicken, vegetables, fish and seaweed which yields a pale, clear and yellowish stock. Popular topping include pickled plums and kamaboko. Tonkotsu Ramen – Pork Bone Ramen, this ramen is made by boiling pork bones, fat and tendons for very long period of time yielding a very cloudy and white coloured broth. Popular toppings and sides are pork slices and beni shoga (pickled ginger). Shōyu Ramen – Soy Sauce Ramen, this ramen is made with chicken and vegetable stock flavoured with soy sauce yielding a brown broth. Popular toppings include marinated bamboo shoots, spring onions, kamaboko, nori, boiled eggs and bean sprouts to name some. Also unlike the first two the noodles used for this ramen are curly variant. Miso Ramen – This ramen is made with miso and fatty chicken which yields a thick, nutty and slightly sweet soup. Popular toppings includes spicy bean paste, corn, leeks, onions, bean sprouts, ground pork and cabbage. Like Shoyu noodles used are the curly variant but thicker. So what category shall I do for today’s post, actually I don’t now as this is more of a free style ramen which I am not sure where to categorize as I used beef stock as its base. Beef ramen as I call it, this was inspired by the two minute beef noodles but trust me it does not taste anywhere near like it. In a stock pot add the leg and rib bones, fill with water until it covers everything. Bring to a boil then turn heat off once the scum rises to the top. Drain and rinse bones with running tap water to remove the attached scum then place them back to the stock pot together with all remaining ingredients. Bring to a boil and simmer in medium heat for 2½ hours. Occasionally check the water level. Using a fine sieve separate liquid and set it aside. Place water and salt in a pot then bring it to a boil, once boiling dip sliced beef few at a time until it changes it colour. Set them aside. Place stock in another pan then bring it to a boil, once boiling add the miso then turn heat off. Season with salt if needed. 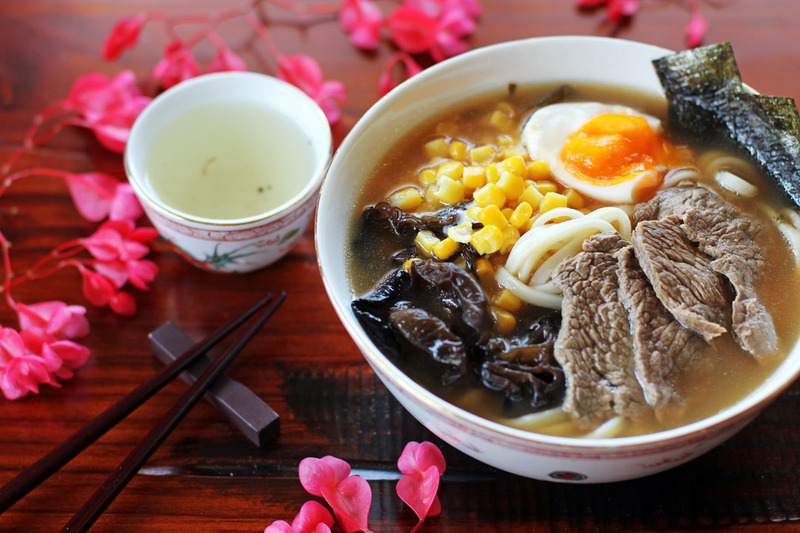 Arrange your noodles in bowl then pour hot boiling soup, top with beef slices, corn, wood ear fungus, egg, nori and Shichimi Togarashi. Serve while hot. Thanks for the little history lesson. I had no idea ramen started in China. 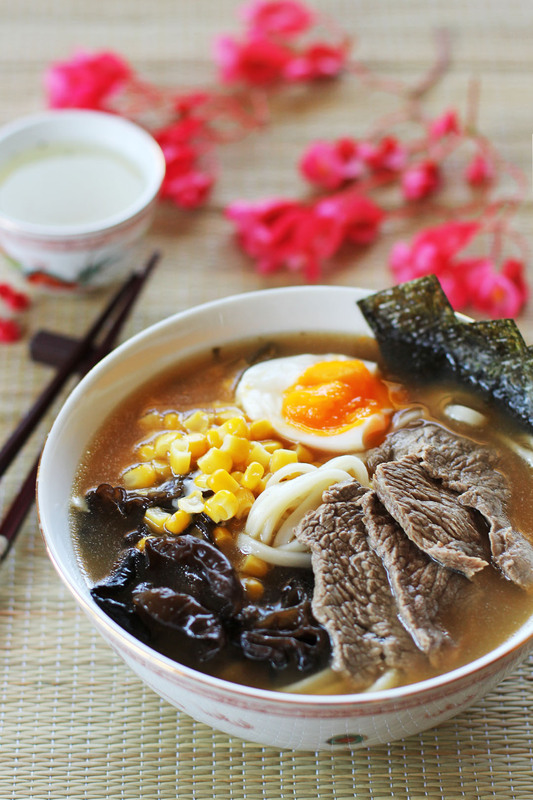 Your beef ramen looks very delicious and perfect for a rainy afternoon. That bowl of ramen look so good! And the egg yolk still looks soft, I still don’t know how to make the boiled egg that way. Hearty and delicious soup is always welcome at our table, this sounds great! I have actually never had ramen, and it looks so delicious! I love ramen! It was a revelation the first time I had the real thing. Love the perfectly cooked egg in yours too. i’ve got some issue on arrage noodle dish, geat job phal! btw, my favourite is tontkotsu with miso ramen with kickin stock! I have never tried beef ramen before as most of the ramen craze currently hitting Sydney are pork based. I’d imagine it would be delicious and similar to a nice bowl of pho. Stunning! Love that pink blossom detail in your background and the stark white of the noodles. Against the silky broth, beef and seaweed sheets, all are equally tasty and artfully arranged! I love any and all noodle dishes, and when used in a soup they’re even better. Who doesn’t like ramen? I certainly do, and this is a great version – thanks so much. I always wonder why we don’t use beef stock for ramen. I have been always curious about that. Since I’ve never tried ramen with beef stock, it’s hard to imagine how it’s like – but I love pho, so why not, right? 😀 Maybe Chinese don’t use beef stock for noodle because a lot of Chinese don’t eat beef? Looks yum! Love this post, and this ramen! I’ve never made homemade ramen before but that’s about to change VERY soon! Beautiful picture Ray! And thanks for demystifying the different types of ramen stock. Goodness – I didn’t know there was so much to “ramen”! I thought those 4 for a dollar Ramen noodle packages only came in 3 flavors. 🙂 That’s the ramen I know. Thanks for educating me that ramen can actually be delicious! The picture of your soup is gorgeous and makes me want to make this right now! Love the egg on top! I especially like the rich and flavorful broth! There are so many ramen joints in Kuala Lumpur now. I never knew so much about ramen, thanks. I’d always assumed it *had* to be made with pork bones. Incidentally, totally agree about “real” stuff being 10000x better than that instant junk. I was lucky enough to visit a ramen museum in Yokohama. Oh my – some of the ramens there… unbelievable! Thick, porky, sedimenty broth… yummmm! Fantastic post, from the history and styles of ramen to the spectacular recipe. Well done!